Pain management in opioid abusers engenders ethical and practical difficulties for clinicians, often resulting in pain mismanagement. Although chronic opioid administration may alter pain states, the presence of pain itself may alter the propensity to self-administer opioids, and previous history of drug abuse comorbid with chronic pain promotes higher rates of opioid misuse. Here, we tested the hypothesis that inflammatory pain leads to increased heroin self-administration resulting from altered mu opioid receptor (MOR) regulation of mesolimbic dopamine (DA) transmission. To this end, the complete Freund's adjuvant (CFA) model of inflammation was used to assess the neurochemical and functional changes induced by inflammatory pain on MOR-mediated mesolimbic DA transmission and on rat intravenous heroin self-administration under fixed ratio (FR) and progressive ratio (PR) schedules of reinforcement. In the presence of inflammatory pain, heroin intake under an FR schedule was increased for high, but attenuated for low, heroin doses with concomitant alterations in mesolimbic MOR function suggested by DA microdialysis. Consistent with the reduction in low dose FR heroin self-administration, inflammatory pain reduced motivation for a low dose of heroin, as measured by responding under a PR schedule of reinforcement, an effect dissociable from high heroin dose PR responding. Together, these results identify a connection between inflammatory pain and loss of MOR function in the mesolimbic dopaminergic pathway that increases intake of high doses of heroin. These findings suggest that pain-induced loss of MOR function in the mesolimbic pathway may promote opioid dose escalation and contribute to opioid abuse-associated phenotypes. SIGNIFICANCE STATEMENT This study provides critical new insights that show that inflammatory pain alters heroin intake through a desensitization of MORs located within the VTA. These findings expand our knowledge of the interactions between inflammatory pain and opioid abuse liability, and should help to facilitate the development of novel and safer opioid-based strategies for treating chronic pain. Abuse of prescription opioids as well as heroin is at an all-time high (Substance Abuse and Mental Health Services Administration, 2014). Moreover, recent data from the National Survey on Drug Use and Health revealed that 80% of new heroin drug users had previously abused prescription opioids, suggesting a possible link between prescription analgesic misuse and heroin use. Reports and case studies have revealed that the analgesic effects of opioids are reduced in drug-abusing individuals; and although chronic opioid administration may alter pain states, the presence of pain itself clearly alters the propensity to self-administer opioids (Rosenblum et al., 2003; Potter et al., 2008; Comer et al., 2010; Chang and Compton, 2013). Rosenblum et al. (2003) have reported that the prevalence of chronic pain in patients under methadone maintenance programs is ∼80%. Interestingly, 30% of these patients reported illegal use of opioids while they were in pain. This is consistent with the notion that prior exposure to opioids is the best predictor for both current and lifetime opioid misuse in chronic pain patients (Turk et al., 2008; Boscarino et al., 2010). Chronic mu opioid receptor (MOR) agonist administration is associated with a partial loss in MOR function, which contributes to the development of morphine tolerance. Indeed, the development of tolerance and desensitization of MORs are part of the core features of addiction (for details, see Christie, 2008). Interestingly, several reports using animal models of inflammatory pain have also revealed desensitization of MORs in DRG neurons, locus ceruleus, and the spinal cord, resulting in reduced antinociceptive effects of MOR agonists (Hurley and Hammond, 2001; Shaqura et al., 2004; Zhang et al., 2004b; Jongeling et al., 2009; Aoki et al., 2014). Based on these findings, we hypothesize that inflammatory pain could also dysregulate MOR function in the mesolimbic dopaminergic pathway, which in turn would modify the reinforcing properties of opioids by altering their intake pattern, especially in animals with a previous history of opioid use. The mesolimbic pathway is a key region in the modulation of opioid addiction, which makes it an ideal circuit to investigate the mechanisms underlying opioid abuse in the presence of pain (Wise et al., 1995; Cui et al., 2014; Fields and Margolis, 2015). Surprisingly, few studies have directly investigated how chronic pain alters MOR function in the mesolimbic dopaminergic pathway. Studies by Narita and collaborators (Ozaki et al., 2002; Narita et al., 2005) investigated the effect of neuropathic pain on the rewarding properties of morphine. By using conditioned place preference (CPP) combined with microdialysis and GTPγS techniques, the authors concluded that, in the presence of neuropathic pain, morphine showed reduced rewarding properties at regular doses (8 mg/kg, s.c.) with a concomitant loss of morphine-induced DA release in the nucleus accumbens (NAc) due to reduced MOR function in the ventral tegmental area (VTA). In contrast, a recent study (Wu et al., 2014) used a spared nerve injury (SNI) model of neuropathic pain and showed that similar doses (5 mg/kg s.c. and 7.5 mg/kg s.c.) exhibited the same ability to induce morphine CPP in SNI rats compared with sham rats. However, in the same study, the authors showed decreased sensitivity to morphine in the injured rats group when the selected dose was 3.5 mg/kg, and this effect was probably mediated by an abnormal increase of TNF-α levels in NAc. Nonetheless, no prior studies have focused directly on examining the impact of pain on subjects with prior exposure to opioids, a population that may be more vulnerable to alterations in MOR sensitivity. Here, we investigated the functional changes induced by inflammatory pain in MORs located in the mesolimbic pathway. We found that pain impacts function of MORs in the VTA with a concomitant loss of opioid-induced dopamine (DA) release in NAc. Next, we found that the presence of inflammatory pain dramatically impacts both opioid intake and associated motivated behavior in a dose-dependent manner. A total of 182 male Sprague Dawley rats (300–340 g at the time of the surgery, Harlan) were individually housed with a 12/12 h dark/light cycle and acclimated to the vivarium for at least 7 d before any manipulation. Rats received food ad libitum until 2 d before starting the behavioral studies, when food restriction (20 g of rat chow per day) commenced and continued until the end of the experiment. All surgeries were performed under isoflurane (1.5 MAC) anesthesia under aseptic conditions. Rats were stereotaxically (Stoelting) implanted with a CMA 12 (Harvard Apparatus) guide cannula targeting the NAc core (coordinates: anteroposterior = 1.5 mm, mediolateral = ±1.4 mm, dorsoventral = −6.0 mm from the skull surface) (Paxinos and Watson, 2007; Hipólito et al., 2008) and with an indwelling jugular catheter for microdialysis experiments or solely with an intrajugular catheter for self-administration procedures. Cannula guides were implanted in a counterbalanced fashion for hemisphere. Catheter patency was maintained by 0.5 ml daily infusions of heparinized (62.5 IU/ml) saline and gentamycin (1.5 mg/ml). Only animals confirmed to have correct microdialysis cannula placement, patent intravenous catheters (assessed using i.v. 28 mg/kg xylazine, Xilagesic 2%, Calier) and animals that completed all training and tests in self-administration procedures were included in the final data and statistical analyses. In the DAMGO-induced DA release in the NAc and VTA experiments, 48 h before the experiment, rats were implanted stereotaxically with unilateral vertical concentric-style microdialysis probes containing 2 mm of active membrane (Hospal AN69; molecular cutoff 60,000 Da) into the NAc core (anteroposterior = 1.5 mm, mediolateral = ±1.6 mm from bregma; and dorsoventral = 8.0 mm from dura (Paxinos and Watson, 2007). Microdialysis probes were implanted in a counterbalanced fashion for hemisphere. In a separate experiment, animals were implanted with a unilateral microdialysis probe in NAc core and with an injection cannula (26G, Plastics One) aiming at the posterior VTA (anteroposterior = −6.1 mm, mediolateral = −2.1 mm, dorsoventral = −8.1 mm angled 10° from perpendicular axes (Paxinos and Watson, 2007; Hipólito et al., 2008, 2011). We selected the complete Freund adjuvant (CFA) model of inflammatory pain. CFA (Calbiochem) was diluted in the same volume of sterile saline before its subcutaneous injection of 0.1 ml in the plantar surface of the hindpaw (Parent et al., 2012; Hipólito et al., 2015). All procedures were approved by the Columbia University Institutional Animal Care and Use Committee in accordance with the National Institutes of Health Guidelines for the Care and Use of Laboratory Animals. Heroin-induced DA release in the NAc. Five days upon recovery from surgery, rats were injected with saline or the CFA into the plantar surface of the hindpaw. Forty-eight hours later, the rats were placed in Plexiglas bowls (BASi) and the intravenous line was connected to a syringe by using P50 tubing. Microdialysis probes (CMA12, 2 mm) were inserted through the guide (Virag and Whittington, 2002) cannula, and artificial CSF (Harvard Apparatus) was continuously perfused at 2.0 μl/min during the entire experiment. Following a minimum stabilization period of 2 h upon probe insertion, samples were collected every 15 min and extracellular DA levels were determined by using offline HPLC with electrochemical detection as described previously (Virag and Whittington, 2002; Hipólito et al., 2008). Once DA baseline level was established (defined as 3 consecutive samples with <10% variation in DA content), a single intravenous heroin dose (75 or 150 μg/kg) was administered and DA levels in the dialysates were analyzed every 15 min for a total experimental time of 90 min. At the end of the microdialysis experiments, rats were first tested for the patency of their intravenous catheters and then were killed, and the brains removed and rapidly frozen in dry ice; 40-μm-thick coronal slices of the NAc core were obtained using a cryostat and stained with cresyl violet to verify proper cannula placement. DAMGO-induced DA release in the NAc and VTA. Forty-eight hours before the experiment, rats were injected with either saline or CFA as described above at the same time that the stereotaxic surgery was performed. On the day of the experiment, rats were placed in Plexiglas bowls and microdialysis probes were continuously perfused at 3.0 μl/min during the entire experiment. Following a minimum stabilization period of 2 h, samples were collected every 20 min and extracellular DA levels were determined by using online HPLC with electrochemical detection as described previously (Hipólito et al., 2008). Once the DA baseline level was established (defined as 4 consecutive samples with <10% variation in DA content), a single intracranial DAMGO dose (6.7 ng/200 nl or 66.8 ng/200 nl) was administered either in the posterior VTA or perfused for 20 min through the microdialysis probe into the NAc core (10 μm) (Hipólito et al., 2008, 2009). Doses administered in the NAc core and in the VTA were calculated from previously published data (Latimer et al., 1987; Hirose et al., 2005; Hipólito et al., 2008). DA levels in the dialysates were analyzed every 20 min for a total experimental time of 80–100 min. At the end of the experiments, rats were killed, and brains were removed for histological confirmation of the microdialysis probe and cannula placement as described above. In vitro electrophysiological experiments on brain slices were conducted 48 h after CFA or saline injection in the hindpaw. Male Sprague Dawley rats (23- to 30-d-old) were deeply anesthetized with isoflurane and decapitated. Brains were quickly removed and submerged in ice-cold sucrose-buffered artificial CSF (in mm as follows: 254 sucrose, 3 KCl, 1.25 NaH2PO4, 10 d-glucose, 24 NaHCO3, 2 CaCl2, and 2 MgSO4). Coronal midbrain sections (230–250 μm) that contained the VTA were cut using a vibratome (VT1200S, Leica Microsystems) in ice-cold sucrose-buffered artificial CSF. VTA slices were submerged in ACSF (in mm as follows: 126 NaCl, 2.5 KCl, 1.4 NaH2PO4, 1.2 MgCl2, 2.4CaCl2, 11 glucose, and 25 NaHCO3) at 34°C for 1 h, and equilibrated with 95% O2 and 5% CO2 before maintenance at room temperature. Slices were then individually transferred to the recording chamber (volume 0.8 ml) and superfused continuously (2.2 ml/min) with 34°C ACSF. Posterior VTA neurons were visualized using differential interference contrast optics on an upright microscope (BX50WI, Olympus). Whole-cell patch-clamp recordings of VTA neurons were obtained using an Axopatch 200B amplifier (Molecular Devices). Electrodes (2–4 MΩ) were filled with pipette solution containing the following (in mm): 140 CsCl, 10 EGTA, 5 HEPES, 2 CaCl2, 1 MgCl2, 2 MgATP, and 3 QX-314 plus 0.05% biocytin. The internal solution had pH 7.3 and osmolality 280–286 mOsm/l. Series resistance (<20 MΩ) was compensated by 70%. Recordings of spontaneous IPSCs (sIPSCs) were obtained in the presence of DNQX (5 μm) and strychnine (5 μm) in the absence of stimulation. DA neurons in the VTA are known to distinct firing properties compared with GABAergic neurons. Although the use of Cs-based intracellular recording solution interfered with our ability to assess these properties, we selectively recorded from large-diameter neurons in the lateral posterior VTA, an area that sends dense projections to the NAc, and in which DA neurons vastly outnumber GABA neurons. In these experiments, a stable 5–8 min recording was obtained before addition of DAMGO for a 5–8 min period. Each recording lasted ∼20 min in total. All recordings were filtered (2 kHz low-pass filter) and sampled (10 kHz) for online and later offline analysis (Axograph X; Axograph Scientific Software). Rat operant-conditioning chambers (Med Associates) were equipped with two retractable levers positioned on the right-hand wall 12.5 cm apart and 5 cm above the floor, a food magazine connected to a food pellet dispenser, two cue lights positioned 2 cm above the levers, and one house light positioned on the top left-hand wall. At the beginning of the session, both levers (active and inactive) were presented and a white light was on above the active lever. Pressing the active lever resulted in drug infusion and a 30 s retraction of both active and inactive levers, along with the turning off of the light cue above the active lever 10 s after the retraction of the levers. Pressing the inactive lever had no effect. After 5–7 d of recovery from surgery, animals began daily (6–7 d a week) 2 h sessions of sucrose self-administration under a fixed-ratio (FR) 1 schedule, where levers were not retracted and the cue light was always on. Once rats acquired the self-administration behavior (by obtaining 60 pellets/session on 3 consecutive sessions), rats were assigned to different experiments. Rats continued 2 h FR1 sessions with sucrose as the reinforcer until stable performance of the task was reached (defined as 5 consecutive completed sessions by obtaining 60 pellets/session). Then the schedule of reinforcement was changed to FR2 for the other 3 sessions. Once they completed the training, the rats were injected with saline or CFA; and 48 and 72 h later, they were tested for sucrose self-administration according to a FR2 schedule. Rats were given 2 h access to heroin (50 μg/kg/infusion) under an FR1 schedule. After stable drug intake was obtained (defined as 5 consecutive sessions in which the number of infusions did not vary by >15% of the mean value obtained across those sessions), the schedule was switched to FR2 for 3 additional sessions. After this training, rats were injected with saline or CFA as described above; and 48 and 72 h later, they underwent 2 consecutive within-session dose–response tests. Briefly, one of three doses of heroin (50, 100, 200 μg/kg/infusion) was made available for a 1 h time period during the session, with a 15 min resting period between doses. Doses were altered by varying the infusion duration. The presentation of the doses was made in an ascending or descending manner at 48 or 72 h after CFA-induced paw inflammation. The order of the presentation of doses in ascending or descending manner was counterbalanced; thus, half of the rats followed ascending order (50, 100, 200 mg/kg) 48 h after receiving CFA or saline in the hindpaw and followed descending order (200, 100, 50 mg/kg) 72 h after CFA or saline injection. The other half of the rats followed descending order 48 h after CFA or saline administration and ascending order 72 h after CFA or saline administration. Progressive ratio (PR) for heroin or sucrose. Rats were given 2 h access to heroin (50 μg/kg/infusion) or sucrose under a FR1 schedule. After stable drug intake was obtained (defined as 5 consecutive sessions in which the number of infusions did not vary by >15% of the mean value obtained across those sessions), the schedule was switched to FR2 and FR5 for a total of six additional sessions. The following day, the animals underwent an initial PR session (baseline PR session). In the PR session, the number of responses on the active lever to obtain the reward increased with the dose. The increase in the number of correct responses followed the equation response ratio = (5 × e(0.2 × infusion number) − 5 rounded to the nearest integer resulting in the following PR steps: 1, 2, 6, 9, 12, 15, 20, 25, 32, 40, 50, 62, 77, 95…(Roberts and Bennett, 1993). In the PR sessions, the ordinal values of the final ratios (the PR step number) were determined because the actual ratio values are derived from an exponential equation and they may violate assumptions of homogeneity of variance in the statistical analysis (Roberts and Bennett, 1993). After the baseline PR session, rats were injected with saline or CFA in the hindpaw; and 48 h later, when inflammation was stable, the rats were placed again in the self-administration chambers to undergo a second PR session. Two doses of heroin, 50 μg/kg/infusion and 200 μg/kg/infusion, were tested in the two PR sessions (baseline and after injection) in different groups of rats. Antinociceptive effects of heroin in the microdialysis experiments. The effects of CFA injection on the antinociceptive properties of heroin were examined using the Plantar Test (Hargreaves method, IITC Life Science). Rats were surgically implanted with a catheter into the internal left jugular vein. Following 5 d of recovery, rats were injected with saline or CFA in the plantar surface of the hindpaw. Paw withdrawal thresholds (4 measurements with 5 min of resting period) were measured for 2 consecutive days before (baseline) and 48 h after (after intraplantar injection) saline or CFA injection. In the same session and after obtaining a measurement of after intraplantar injection, 75 or 150 μg/kg of heroin was infused through the intravenous line, and paw withdrawal thresholds were measured every 5 min for a total time of 30 min. Briefly, animals were placed in Plexiglas boxes on top of a glass surface. After 30 min of habituation, a radiant heat source was focused on the plantar surface of the hindpaw, and the latency of paw withdrawal from the radiant heat stimulus was recorded. Four measurements with at least a 5 min interval between trials were obtained for each session. The intensity of the light beam was adjusted so that baseline latencies were ∼10 s in naive rats. A cutoff time of 30 s was imposed to prevent tissue damage. Rats undergoing heroin self-administration under an FR2 schedule were also tested for thermal sensitivity using the plantar test as described above. Paw withdrawal thresholds were assessed 2 h before starting the self-administration session. We measured paw withdrawal thresholds before (three baseline measurements) and during self-administration procedures (three measurements during heroin self-administration training and two after CFA or saline injection in the hindpaw). Basal levels of DA (mean ± SEM) were expressed as fmol in 10 μl (analyzed sample volume) for heroin experiments and as fmol in 65 μl in DAMGO experiments. Three or four (for heroin and DAMGO experiments, respectively) basal values were averaged to obtain a basal level for each animal. Differences in basal levels between groups (saline and CFA treated animals) were evaluated using the unpaired Student's t test. In all experiments, DA levels obtained before and after heroin intravenous administration or DAMGO intracranial administration were transformed to percentages of baseline for each individual rat and were statistically analyzed by a mixed two-way ANOVA for repeated measures, with group (saline or CFA injection) taken as the between factor and time the within-subjects factor. In the heroin intravenous administration experiments, significant effects of time were analyzed by two-way ANOVA with repeated measures per each group followed by Dunnett's post hoc comparisons test, and the time × group interaction was further analyzed using the Bonferroni multiple-comparisons test. In the DAMGO intracranial administration experiments, significant effects of time and time × group interaction were further analyzed by Bonferroni multiple-comparisons test. Areas under the curve (AUC) were calculated from 0 to 90 min for each rat from percentage data and statistically analyzed by mixed two-way ANOVA with group and dose as between-subject factors. Significant effects of group and the interaction group × dose were analyzed by Bonferroni corrections for multiple comparisons. For analysis, sIPSCs above a preset threshold (3.5 SDs above baseline noise, and exceeding 13 pA) were automatically detected by a sliding template algorithm and then manually checked offline. Mean amplitudes and interevent intervals were calculated by analyzing events over the last 3 min of drug superfusion (before and during DAMGO). Normalized cumulative distribution plots of IPSC interevent intervals were constructed and analyzed using the Kolmogorov–Smirnov test. Mean sIPSC amplitudes were determined by Gaussian fits to amplitude histograms in 5 pA bins (as in Bobeck et al., 2014). All numerical data are expressed as mean ± SEM. All distributions were tested for normality using the Shapiro–Wilk normality test. Statistical comparisons between CFA and saline groups were made using Student's t test, and comparisons to normalized baseline were calculated using Wilcoxon signed rank test. For the within-session heroin self-administration dose–response curves, the total intake per dose was analyzed by using a three-way ANOVA with repeated measures selecting group as a between-subject factor and dose and order of presentation as within-subject factors. Because no statistical differences were detected in the within-subject factor of order of presentation, data from both sessions were pooled and data were further analyzed by two-way ANOVA with group as a between factor and dose as a within factor, followed by Bonferroni corrections for multiple comparisons when differences were detected. For the sucrose self-administration experiments, active and inactive lever responses were analyzed by using repeated-measures one-way ANOVA, and time to complete the task was evaluated using unpaired Student's t test. For the heroin and sucrose PR self-administration sessions, the PR step number was analyzed by using a mixed two-way ANOVA with repeated measures with group as a between-subjects factor and session (baseline and after injection) as a within-subjects factor followed by Bonferroni corrections for multiple comparisons when interactions were found to be significant. Paw withdrawal thresholds were evaluated using a mixed two-way ANOVA with repeated measures with group as a between-subjects factor and session number as a within-subjects factor followed by Bonferroni corrections for multiple comparisons. For all ANOVAs, homogeneity of variance was tested before an ANOVA was performed, and the significance level was always set at p < 0.05. Statistical analyses were performed with IBM SPSS statistics 20 software or GraphPad (Prism) software for Windows. To test the hypothesis that inflammatory pain could dysregulate the function of the mesolimbic dopaminergic pathway, we first conducted in vivo microdialysis analyses to measure heroin-evoked DA release in the NAc core in the presence of inflammatory pain (Fig. 1). Although several reports have investigated the role of the DA increase in NAc shell versus NAc core in drug-induced motivated behaviors (Everitt and Robbins, 2005), we elected to focus on the NAc core given its role in instrumental action according to the value of the predicted outcome and motivated behavior (Di Chiara, 2002; Saddoris et al., 2013). Forty-eight hours following the administration of CFA or saline (control) in the rat hindpaw (n = 5 or 6 per group), a microdialysis probe targeting the NAc core was inserted, and extracellular DA content in the dialysates was monitored every 15 min. Once a stable baseline for DA was achieved (<10% variation in three consecutive samples), one of two heroin doses (75 or 150 μg/kg) was administered through an intravenous line, and extracellular DA levels were monitored for 90 min. Baseline DA levels (mean ± SEM) were calculated from a standard curve as 11.06 ± 1.25 fmol/10 μl and 17.78 ± 3.97 fmol/10 μl for the control versus inflamed group, respectively. These results indicate that the presence of inflammation-induced pain does not have a significant effect on basal extracellular DA levels (n = 10 or 11, t test, p = 0.125). Interestingly, we observed that, whereas the administration of intravenous heroin (75 μg/kg) triggered an increase in extracellular DA levels of 197.9% compared with baseline in control rats, this same dose of heroin elicited a much smaller increase in DA levels (117.3%) compared with baseline in CFA-treated rats (two-way ANOVA for repeated measures: within-subject effect of time, F(8,72) = 4.841, p < 0.000; and interaction of time × group, F(8,72) = 2.278, p = 0.031; Figure 1B). Indeed, heroin-evoked DA release in the CFA-treated group was significantly lower than the control group (two-way ANOVA: between-subject effect group, F(1,9) = 13.599, p = 0.005, n = 5 or 6) at 30 min (p(30) = 0.048) and 45 min (p(45) = 0.024) after infusion of intravenous 75 μg/kg heroin. These data suggest that inflammatory pain produces a robust attenuation of heroin-induced DA release in the NAc at doses previously shown to be reinforcing (Hemby et al., 1995; Martin et al., 1996; Caprioli et al., 2007). While previous reports have found a reduction in release of DA in the NAc following the administration of an 8 mg/kg morphine subcutaneous challenge in rodents with neuropathic pain (Ozaki et al., 2002; Ozaki et al., 2003), the effects of higher doses of opioids have not been previously examined. Therefore, we next examined the effects of a higher dose of heroin (150 μg/kg, i.v.) on accumbal DA release in the NAc in control and in CFA-treated rats (Fig. 1C). The highest dose of heroin induced a significant increase in DA release in control rats and in CFA-treated rats (two-way ANOVA for repeated measures: within-subjects effect of time, F(8,64) = 11.828, p < 0.0001; and interaction of time × treatment, F(8,64) = 2.879 p = 0.008, n = 5; Figure 1C). Interestingly, animals experiencing inflammatory pain showed greater increases in extracellular DA levels (154% from baseline) in comparison with control animals (131.9% from baseline), although no overall significant differences between the two groups were found (between-subjects effect of group, F(1,8) = 4.795, p = 0.060). To further quantify this inflammatory pain-induced effect on the dose–response for heroin-evoked DA release, we calculated the AUC between 0 and 90 min for each treatment group (Fig. 1D). This measure allowed us to compare the total effect on DA extracellular levels in the NAc in inflammatory pain induced by the administration of heroin in both groups. Our results further corroborated a different pattern of DA release in CFA-treated rats (two-way ANOVA: effect of group, F(1,17) = 0.002, p = 0.965; effect of dose, F(1,17) = 4.505, p = 0.049; and interaction group × dose, F(1,17) = 18.964, p < 0.0001). Rats experiencing inflammatory pain had a robust reduction in accumbal DA release at the lowest heroin dose tested (p = 0.006), whereas they showed a robust DA release when the dose of heroin was increased to 150 μg/kg (p = 0.007) compared with the control group (Fig. 1D). Interestingly, there was no significant difference in heroin-elicited accumbal DA release between control rats that received 75 μg/kg heroin and CFA-treated rats that received 150 μg/kg heroin (p = 0.125). Together, these results indicate that rats suffering from inflammatory pain require larger doses of opioid to produce a significant release of DA in the NAc. Inflammatory pain alters heroin-evoked release of DA in the NAc. A, Schematic of the experimental design for microdialysis experiments. Effect of 75 μg/kg (B) and 150 μg/kg (C) intravenous heroin administration on DA levels in control (black) and in CFA-treated (red) animals. Data are mean ± SEM represented as percentage from baseline; n = 5 or 6 per group. Heroin was administered at time 0. *p < 0.05, significant differences from baseline (Dunnett's test). #p < 0.05, significant differences between the two groups at a time point after heroin administration (two-way ANOVA with repeated measures followed by Bonferroni multiple comparisons). D, Percentage change in DA levels induced by heroin calculated as AUC from 0 to 90 min for control (black) and CFA-treated (red) animals at the two doses of heroin tested. At 75 μg/kg of heroin, the AUC value was significantly lower in CFA-treated animals compared with control animals. #p < 0.05 (two-way ANOVA followed by Bonferroni multiple comparisons). Doubling the heroin dose in CFA-treated rats increased the value of the AUC significantly (*p < 0.05) but did not change the value obtained in control rats receiving 75 μg/kg. The AUC for CFA-treated rats receiving 150 μg/kg heroin is significantly higher versus AUC for control rats receiving 150 μg/kg heroin (#p < 0.05). E, Diagram of coronal sections indicating the placement of microdialysis probes in the NAc core. Probe locations for control (black) and CFA-treated (red) rats receiving 75 μg/kg of heroin are represented in the left hemisphere, whereas probe locations for control and CFA-treated rats receiving 150 μg/kg of heroin are represented in the right hemisphere. In some cases, one plotted line corresponds to more than one dialysis membrane. Numbers to the side of the coronal sections indicate distance anterior to bregma. Adapted from the rat brain atlas of Paxinos and Watson (2007). Previous data have shown that pain relief, by blocking pain afferents with lidocaine, increases extracellular levels of DA in the NAc (Navratilova et al., 2012). To elucidate whether CFA-induced inflammation modifies the antinociceptive properties of heroin at the same doses used in the microdialysis experiments, we determined the analgesic potency of heroin in a separate group of rats using the plantar test (Fig. 2). We measured thermal sensitivity to radiant heat for two sessions (averaged as baseline) before injecting saline or CFA in the plantar surface of the hindpaw (n = 5 or 6/group). Forty-eight hours following injection of CFA or saline, thermal sensitivity was measured every 5 min for a total period of time of 30 min before and after the intravenous administration of 75 or 150 μg/kg of heroin. Hypersensitivity to heat induced by CFA administration was significantly reversed by the intravenous administration of 75 and 150 μg/kg heroin; and interestingly, no difference was observed between the two heroin doses tested (Fig. 2B,C; two-way ANOVA for repeated measures: within-subjects effect time point, F(8,144) = 18.507, p < 0.0001; within-subjects effect time point × dose × treatment, F(8,144) = 1.687, p = 0.106). Indeed, paw withdrawal thresholds after either 75 or 150 μg/kg heroin intravenous administration were similar in control and pain rats (two-way ANOVA: between-subjects effect of treatment, F(1,18) = 1.778, p = 0.199; between-subjects effect of dose, F(1,18) = 3.305, p = 0.086 and between-subjects effect dose × treatment, F(1,18) = 1.285, p = 0.272). These results indicate that the inflammatory pain-induced alterations in DA transmission in the NAc are not related to changes in the antinociceptive properties of heroin. These data further support the idea that the presence of inflammatory pain selectively impacts the sensitivity to the rewarding properties of heroin and that this effect is not due to alterations in heroin-induced antinociception. Antinociceptive properties of 75 (B) or 150 μg/kg (C) of heroin in control and CFA-treated rats measured as paw withdrawal latencies to radiant heat stimulation. Schematic of the experimental design is shown in A. Data are mean ± SEM of paw withdrawal latency measured in seconds. #p < 0.05, differences between groups (Bonferroni multiple comparisons). n = 5 or 6 per group. *p < 0.05, differences in the within-subjects effect of time for animals treated with saline or CFA (Bonferroni multiple comparisons). Next, we conducted studies to identify the cellular mechanism underlying the effects of CFA on heroin-evoked DA release in the NAc core. DA release in the VTA-NAc pathway mediates the reinforcing properties of drugs and natural reinforcers. This DA release is tightly regulated, at least partially by MORs in this pathway (Johnson and North, 1992; Devine et al., 1993; Wise et al., 1995; Le Merrer et al., 2009; Wassum et al., 2009; Olszewski et al., 2011). We hypothesized that inflammatory pain may negatively impact the function of MOR within the reward pathway and thereby influence opioid-evoked DA release in the NAc. Thus, we first analyzed the effect of inflammatory pain on accumbal DA release induced by a single dose of the selective MOR agonist DAMGO administered either in the NAc (via perfusion of DAMGO 10 μm) or in the VTA (via microinjection of 6.7 ng/200 nl) (Fig. 3B andFig. 3D, respectively). Inflammatory pain decreases DAMGO-induced release of DA in the NAc when administered in the VTA but not when locally administered in the NAc. A, Schematic of the experimental design for microdialysis experiments. Effect of DAMGO 10 μm infused in the NAc (B) and 6.7 ng or 66.8 ng microinjection in the VTA (D, E) on DA extracellular levels in the NAc core for control (black dots) and inflamed (red squares) rats. Data are mean ± SEM represented as percentage from baseline; n = 5 or 6 per group. #p < 0.05, significant differences between groups (Bonferroni multiple comparison). *p < 0.05, significant differences in the within-subjects effect of time for animals treated with saline or CFA (Bonferroni multiple comparisons). C, Diagram of coronal sections indicating the placement of microdialysis probes in the NAc for control (black) and CFA-treated (red) rats in the NAc DAMGO infusion experiment. F, Diagram of coronal sections indicating the placement of microdialysis probes in the NAc for control (black) and CFA-treated (red) rats in the intra-VTA injection of DAMGO experiment. G, Diagram of coronal sections indicating microinjection cannula tips in VTA for control (black) and CFA-treated (red) rats in the intra-VTA injection of DAMGO experiment. Bars and dots could represent more than one probe or cannula placement. Baseline DA levels (mean ± SEM) were calculated from a standard curve as 66.4 ± 11.7 fmol/65 μl and 69.7 ± 8.3 fmol/65 μl for the control versus inflamed group, respectively. In agreement with the microdialysis data described above, our results indicate that the presence of inflammatory pain does not have a significant effect on basal extracellular DA levels (n = 10, t test, p = 0.823). As expected (Hipólito et al., 2008), the administration of 10 μm DAMGO in the NAc core triggered a significant increase in DA release (up to 140% from baseline 60 and 80 min following DAMGO administration, Dunnett's test, p < 0.05 for time 60 and time 80 compared with baseline; Fig. 3B) in saline-treated rats. However, the effect of DAMGO was reduced in CFA-treated rats. Although intra-NAc DAMGO triggered an increase up to 118% from baseline, no significant differences were found with respect to baseline or compared with control rats (n = 5/group; mixed two-way ANOVA between subjects (group) F(1,10) = 3.542, p < 0.089; Figure 3B). 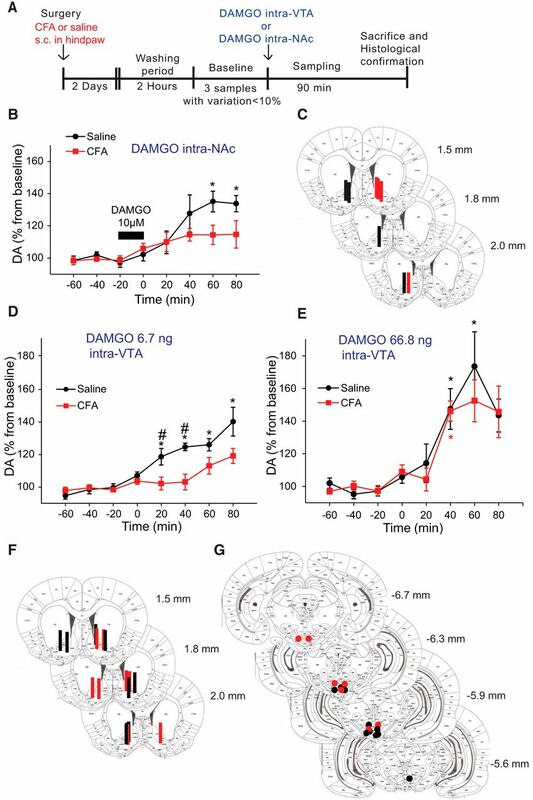 In contrast, intra-VTA administration of 6.7 ng DAMGO elicited a significant release of DA in the NAc in control rats, and this effect was blunted in CFA-treated rats (Fig. 3D). Indeed, mixed two-way ANOVA analysis detected differences between the two groups (group effect, F(1,8) = 12,133, p = 0.008 and interaction time × group F(7,56) = 2.462, p = 0.006). Control rats showed a significant increase in DA release in the NAc up to 125%–140% from baseline, which was initiated 20 min following DAMGO administration and lasted until the end of the experiment. In CFA-treated rats, the administration of DAMGO intra-VTA induced a much smaller increase in DA release that was not significantly different from baseline (Bonferroni multiple comparisons, p(20) = 0.044, p(40) = 0.018, p(60) = 0.018, p = 0.004; Fig. 3C). This loss of DAMGO effect was especially relevant 20 and 40 min following the administration of DAMGO locally in the VTA (Bonferroni multiple comparisons between groups, p(20) = 0.044 and p(40) = 0.004 vs control group; Fig. 3D). Together, these data reveal a reduced ability of the MOR agonist DAMGO to increase DA release in the NAc, suggesting a decrease in MOR function within the reward pathway in inflammatory pain. Interestingly, this loss of MOR function is more evident in the VTA. To further study the plausible desensitization of the MOR in the VTA in CFA-treated rats, we administered a 10× higher dose of DAMGO in the VTA and monitored the DA release in the NAc core. Intra-VTA administration of 66.8 ng overcame the effects on DAMGO-induced DA release in the NAc (Fig. 3E). Both saline and CFA-treated rats experienced a significant increase of DA extracellular levels from baseline after DAMGO application (n = 5/group; mixed two-way ANOVA within subjects (time), F(7,56) = 18.392, p < 0.001; Bonferroni multiple comparisons from baseline: saline group, p(40) = 0.013 and p(60) = 0.032; CFA group, p(40) = 0.018). More interestingly, the mixed two-way ANOVA analysis did not detect differences between the two groups (group effect, F(1,8) = 0.241, p = 0.636; and interaction time × group, F(7,56) = 0.488, p = 0.839), further supporting the notion that the increase in the dose reverses the CFA-induced effects. The results presented above suggest that the presence of inflammatory pain impacts the function of MOR within the reward pathway, and more specifically in the VTA. DA neuron firing in the VTA is tightly controlled by tonic GABA release, and GABAergic inhibition of DA neuron firing is reduced by the activation of MORs (Gysling and Wang, 1983; Johnson and North, 1992; Jalabert et al., 2011; Matsui et al., 2014). To investigate whether inflammatory pain affects MOR-mediated GABA transmission in the VTA, we recorded sIPSCs in the VTA in control and CFA-treated rats. sIPSCs were readily observed in the presence of DNQX and strychnine (Fig. 4A). As expected, superfusion of DAMGO (1 μm) decreased the frequency of sIPSCs in VTA neurons from saline-treated rats by 48% (Fig. 4A–D; p = 0.016, n = 7) (Theile et al., 2011). The decrease in sIPSC frequency was associated with a rightward shift in the cumulative probability distribution of the sIPSC interevent intervals (Fig. 4C; p = 1.29, Kolmogorov–Smirnov statistic for pre-DAMGO vs DAMGO). DAMGO did not significantly diminish the frequency of sIPSCs in neurons from CFA-treated rats (75% of pre-DAMGO levels; Fig. 4A,C,D; p = 0.094, n = 6; cumulative probability distribution of interevent intervals, p = 0.025, Kolmogorov–Smirnov statistic for pre-DAMGO vs DAMGO). DAMGO also reduced the amplitude of sIPSCs in saline-, but not CFA-treated, rats (Fig. 4C,D; p = 0.016 and 0.69, respectively; cumulative probability distribution of amplitude for saline, p = 0.001; for CFA, p = 0.003, Kolmogorov–Smirnov statistic for pre-DAMGO vs DAMGO). In addition, DAMGO had no significant effect on the IPSC kinetics in CFA or morphine-treated rats (Fig. 4A, inset). These results show that DAMGO diminished the frequency and amplitude of GABAergic sIPSCs in neurons from saline-treated animals, as expected. This inhibition of GABA release was significantly diminished in CFA-treated neurons, which suggests desensitization of the MOR. To test the hypothesis that MOR desensitization in CFA-treated slices could be overcome with a higher concentration of MOR agonist, we repeated these experiments by superfusing 3 μm DAMGO. As expected, superfusion of DAMGO (3 μm) decreased the amplitude and frequency of sIPSCs in VTA neurons from saline treated animals by 80% and 49%, respectively (Fig. 4D; for amplitude, p = 0.031; for frequency, p = 0.031, n = 6). In contrast with our previous experiment using 1 μm DAMGO, in neurons from CFA treated rats, 3 μm DAMGO diminished the amplitude of sIPSCs (79% of pre-DAMGO levels; Fig. 4D; p = 0.031, n = 6). There was also a robust decrease in the frequency of sIPSCs (43% of pre-DAMGO levels; Fig. 4D; p = 0.031). Thus, increasing the concentration of DAMGO to 3 μm restored the loss of MOR-mediated inhibition of GABA release in CFA-treated rats. Moreover, the DAMGO-induced decrease in GABA release was reversible by naloxone (3 μm, Fig. 4E). These data further substantiate MOR desensitization in the VTA during inflammatory pain. Inflammatory pain alters DAMGO inhibition of GABA release in the VTA. A, Recordings of sIPSCs before (Pre) and after addition of DAMGO (1 μm) in two different VTA neurons from saline-treated (black traces) and CFA-treated (red traces) rats. Inset, Averaged sIPSCs obtained over 3 min epochs before and during DAMGO. B, Time course of the frequency of occurrence of sIPSCs during application of DAMGO (1 μm), for the same saline-treated neuron depicted in A (black traces) and C. C, Gaussian fits to amplitude histograms and cumulative distribution plots (for interevent intervals) of sIPSCs before and during DAMGO (1 μm) (Kolmogorov–Smirnov statistic for Pre vs DAMGO, for interevent interval cumulative distributions; for saline: black traces, p = 1.29; for CFA: red traces, p = 0.025, n = 6 or 7 per group). D, Bar chart of the mean effect of DAMGO on sIPSC frequency and amplitude in VTA neurons from saline (black) and CFA-treated (red) rats, expressed as a percentage of the pre-DAMGO level ± SEM. *Significant differences from baseline (Wilcoxon signed rank test). ##Significant differences between the CFA and saline groups (Student's t test, p = 0.019, n = 6 or 7 per group). E, Record of sIPSCs before and after addition of DAMGO (3 μm) and naloxone (3 μm). Next, we conducted intravenous heroin self-administration experiments to determine whether the above observed pain-induced decrease in MOR-dependent accumbal DA release could account for changes in the reinforcing effects of opioids in the presence of pain. This is especially relevant in individuals with prior opioid exposure because the presence of pain may affect the reinforcing properties of the opioid, which can lead to changes in the pattern of drug intake. To this end, we investigated the effects of inflammatory pain in rats that had been trained under FR1 and FR2 schedules of heroin reinforcement (50 μg/kg) for at least 8 sessions (Fig. 5A,C). 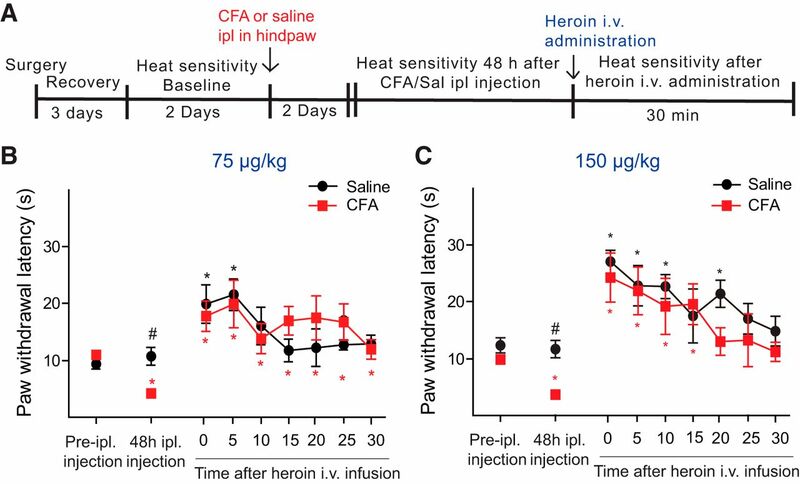 Once the three sessions of heroin self-administration under FR2 schedule were completed, rats were injected with saline or CFA in the hindpaw, as described above, and two within-session dose–response analyses were conducted 48 and 72 h after CFA or saline injection (Martin et al., 1996). All rats completed two sessions of self-administration where they were exposed to 50, 100, and 200 μg/kg/infusion of heroin under an FR2 schedule for 1 h in either an ascending or descending order over 2 consecutive days (sessions were randomized in a counterbalanced fashion). Importantly, throughout the experiment, we measured thermal sensitivity to heat using the plantar test (Fig. 5B) before starting the self-administration session to assess whether repeated self-administration of opioids alters thermal sensitivity. 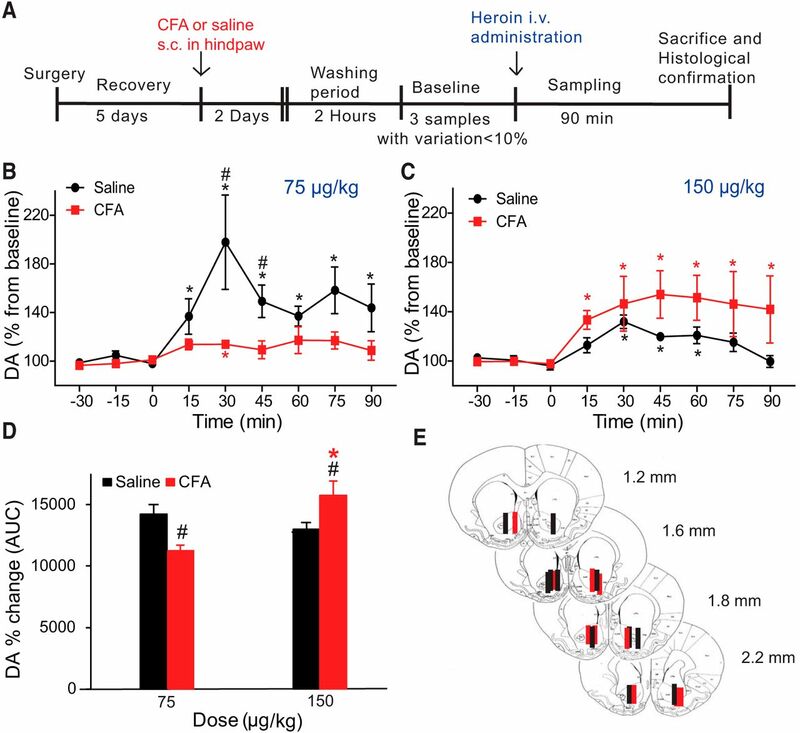 We observed no opioid-induced hyperalgesia resulting from prior heroin self-administration in either CFA- or saline-injected rats as previously reported (Edwards et al., 2012). As expected, the administration of CFA following at least 8 sessions of heroin self-administration produced a significant increase in heat sensitivity. During these last 8 training sessions, rats first showed to be able to distinguish between active and inactive lever; and second, rats showed to present a stable heroin intake as can be deducted for their stable response pattern on the active lever during FR1 and doubling the number of responses only in the active lever during the FR2 (Fig. 5C). Interestingly, we found that inflammatory pain caused significant alterations in the pattern of heroin intake in a dose-dependent manner (n = 5 or 6/group, F(2,27) = 4.104, p = 0.028) (Fig. 5D), regardless of the order of dose presentation (F(2,27) = 0.020, p = 0.980). Saline-treated rats adjusted their number of infusions self-administered to maintain their drug intake across doses showing a linear profile when adjusted to a semilogarithmic scale (ascending: y = 5.647x + 14.7, R2 = 0.9465; and descending: y = −3.986x + 11.2, R2 = 0.8120). However, CFA-injected rats exhibited a different profile, with a slope being close to 0 (ascending: y = −0.886x + 5.672, R2 = 0.955; and descending: y = 0.831x + 1.395, R2 = 0.138). When we combined the data from both dose–response sessions and calculated intake for each dose, we observed that rats experiencing pain self-administered significantly more heroin at 200 μg/kg/infusion (n = 10–12/group, p = 0.002) compared with their control counterparts (Fig. 5E). CFA did not induce any significant change in intake at 100 μg/kg heroin, although a decrease was observed at 50 μg/kg versus control rats. This effect was not significant, however (Fig. 5E). Inflammatory pain increases heroin intake at high but not low doses under FR schedules of reinforcement. A, Schematic of the experimental design is shown for the training and dose–response tests of heroin self-administration. B, Paw withdrawal latencies (mean ± SEM in seconds) to radiant thermal stimuli during training and dose–response sessions for heroin self-administration. 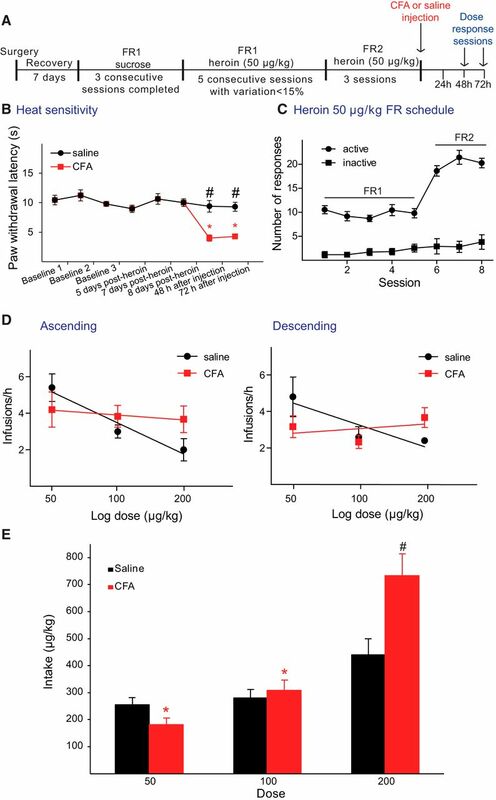 No differences from baseline latency were observed during training with self administration; however, CFA-treated rats (red) showed a decrease in paw withdrawal latency compared with saline-injected rats (black) 48 and 72 h after the injection. #p < 0.05, differences between groups (two-way ANOVA followed by Bonferroni multiple comparisons). *p < 0.05, differences within a group (two-way ANOVA followed by Bonferroni multiple comparisons). n = 5 or 6/group. C, Number of responses in the active (circle) versus inactive (square) lever during the training period under fix-ratio FR1 and FR2 schedules of reinforcement. Data are mean ± SEM; n = 11. D, Within-session dose–response curve in ascending (left panel) and descending (right panel) order of presentation of the dose for control (black) and CFA-treated (red) rats. Data are mean ± SEM of the number of infusions in 1 h blocks for each dose represented in semilogarithmic scale. Linear regressions are also represented in the graphs. E, Total heroin intake (μg) for each dose tested. Data are mean ± SEM of the pooled total heroin intake of both sessions performed per animal. Pain increased total intake when exposed to 200 μg/kg heroin. #p < 0.05, compared with control rats (two-way ANOVA with repeated measures followed by one-way ANOVA with Bonferroni corrections for multiple comparisons). n = 5 or 6 per group. A significant effect of dose on total heroin intake was observed for the pain group but not for the control group. *p < 0.05. We conducted similar experiments using sucrose pellets as a positive natural reinforcer (Fig. 6A). In these control experiments, the presence of pain did not alter responding for sucrose when tested on the active lever according to an FR schedule of reinforcement (n = 5 or 6, F(1,9) = 0.057, p = 0.822; Fig. 6B), the inactive lever (n = 5 or 6, F(1,9) = 0.083, p = 0.799), or in the time to complete the self-administration of 60 sucrose pellets (n = 4 or 5, F(1,7) = 0.004, p = 0.954; Fig. 6C). These data suggest that inflammatory pain does not affect lever pressing for sucrose under an FR schedule of reinforcement. Inflammatory pain does not affect lever pressing and time to complete the instrumental task under FR2 schedule of sucrose reinforcement. A, Schematic of the experimental design. B, Effect of CFA injection on correct and incorrect FR2 responding for sucrose pellets. Data are mean ± SEM of the number of correct and incorrect responses of the control and CFA-treated rats during the training period and 48 and 72 h after saline or CFA injection. No statistical differences were observed in the number of correct or incorrect responses before and after treatment or between groups (n = 5 or 6 per group). 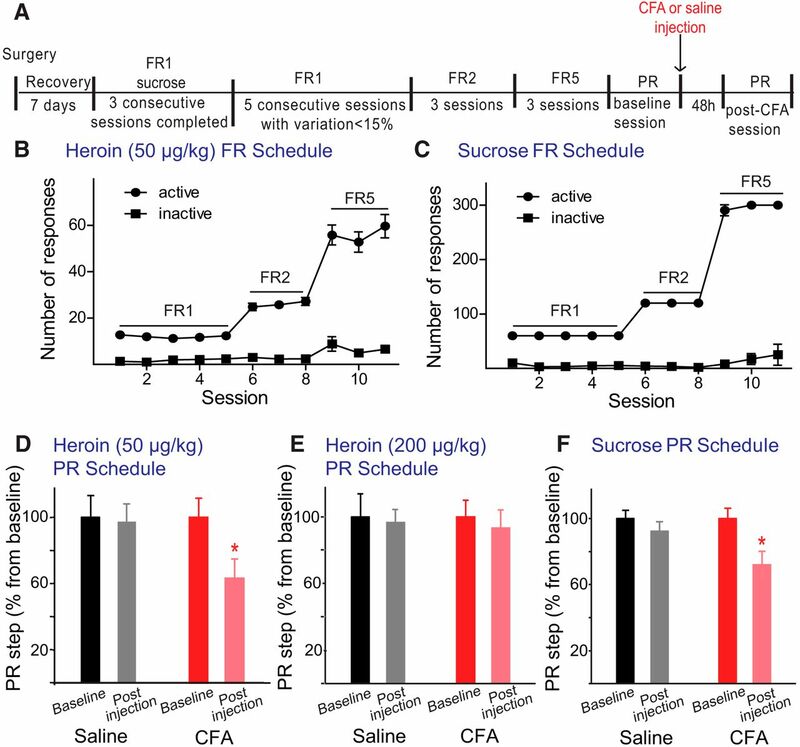 C, Effect of CFA on time to complete the sucrose self-administration under an FR2 schedule of reinforcement during the training period and after CFA (red) or saline (black) injection. Time (mean ± SEM in minutes) to complete the session by self-administering 60 sucrose pellets is represented for each session. No differences were detected before and after CFA or saline injection and between CFA and saline-treated rats. n = 5 or 6 per group. We next investigated the effect of inflammatory pain on motivated behavior given the fact that DA levels, via MOR activation the reward pathway, influence the motivation for drug intake measured in a PR schedule of reinforcement (Roberts and Bennett, 1993). Because DA release was reduced, presumably via loss of MOR function following the administration of 75 μg/kg intravenous heroin, and it increased following the administration of 150 μg/kg intravenous heroin in the presence of inflammatory pain (Fig. 1B,C), we hypothesized that motivation for 50 and 200 μg/kg/infusion would be likewise affected. Rats were trained to self-administer 50 μg/kg/infusion heroin (n = 10) or sucrose pellets (n = 10) under FR1, FR2, and FR5 schedules of responding for at least 11 sessions (Fig. 7B,C). Afterward, rats underwent a heroin (50 or 200 μg/kg/infusion) or sucrose PR baseline session to measure initial ordinal value of the final ratio to which the rat responded (PR step number). Following the baseline PR training session, rats were injected with either saline or CFA in the hindpaw. Forty-eight hours after the injection, rats were tested again under a PR schedule of reinforcement and the completed PR step number was recorded and transformed to percentage of baseline. Inflammatory pain reduced PR step number from baseline to 72% (PR step number: baseline: 14.2 ± 0.9; after injection: 10.2 ± 1.2) with sucrose as the reward (Fig. 7F; two-way ANOVA for repeated measure: within-subjects effect of session, F(1,8) = 8.421, p < 0.001; Bonferroni multiple comparisons, p = 0.020). In rats trained with 50 μg/kg/infusion (dependent rats), the presence of inflammatory pain reduced the PR step number from baseline to 63% (PR step number: baseline 9.8 ± 1.5; after injection: 6.5 ± 1.4) with 50 μg/kg/infusion heroin as the reinforcer (Fig. 7D; two-way ANOVA for repeated measures; within-subjects effect of session, F(1,8) = 20.954, p = 0.002 and interaction effect of session × group, F(1,8) = 15.493, p = 0.004, Bonferroni correction for multiple comparisons, p = 0.011). Interestingly, this effect of inflammatory pain on motivated behavior for heroin was completely abolished when the heroin dose was increased up to 200 μg/kg/infusion (Fig. 7E). In this regard, no significant differences were detected before and after CFA injection in the PR step reached by the rats with 200 μg/kg/infusion heroin as reward (PR step number: baseline 4.8 ± 0.5; after injection 4.0 ± 0.4; two-way ANOVA for repeated measures, within-subject effect of session, F(1,8) = 0.260, p = 0.624; interaction effect of session × group, F(1,8) = 0.001, p = 0.978). Inflammatory pain impacts motivated behavior. A, Schematic of the experimental design is shown for the training and PR sessions for heroin and sucrose self-administration. Number of responses on the active lever (circle) versus the inactive lever (square) under FR1, FR2, and FR5 schedules of reinforcement with 50 μg/kg/infusion heroin (B) or sucrose pellets (C) as the reinforcer (data are mean ± SEM). Effect of inflammatory pain on the PR step number (% from baseline) 48 h after saline (black represents baseline; gray represents after injection) or CFA injection (red represents baseline; pink represents after injection) with heroin 50 μg/kg/infusion (D), 200 μg/kg/infusion (E), or sucrose pellets (F) as the reinforcer. *p < 0.05 versus baseline (two-way ANOVA with repeated measures followed by Bonferroni corrections for multiple comparisons). n = 10 per group. Exposure to opioids in pain patients with a prior history of drug use has been identified as a potential risk for opioid abuse and/or relapse (Chang and Compton, 2013). The results presented here provide new evidence that pain-induced MOR desensitization affects opioid-evoked DA transmission within the reward pathway. This diminished DA release thereby affects the reinforcing properties of heroin such that higher doses of the drug are necessary to produce reinforcing effects. Opioid receptors, mainly MORs, located in the mesolimbic pathway, are thought to mediate the reinforcing properties of opioids, natural reinforcers, and alcohol via regulation of DA extracellular levels within the NAc (Devine et al., 1993; Xiao and Ye, 2008; Le Merrer et al., 2009; Giuliano et al., 2013). This effect is mediated by the inhibition of GABA release in the VTA via the activation of presynaptic MORs of GABA interneurons or GABA projections from the rostromedial tegmental nucleus (RMTG), which then leads to an increase in DA release in the NAc through a disinhibition mechanism (Johnson and North, 1992; Sánchez-Catalán et al., 2014; Siuda et al., 2015) or local activation of MORs in the NAc core and discrete areas of the NAc shell (Hipólito et al., 2008). Although clinical and preclinical reports have shown a decrease in DA signaling during pain conditions (Ozaki et al., 2003; Jarcho et al., 2012; Wu et al., 2014), few studies have examined whether this effect may be mediated by alterations in MOR function. Nonetheless, function of MORs has been evaluated mainly in areas of the CNS involved in nociception. In an early study, Zhang et al. (2004a) revealed that proinflammatory cytokines desensitize MORs in DRG, providing a first insight into the effects of inflammatory pain on MOR function. Similar studies have mainly investigated MOR function from a nociception point of view in different nuclei of the CNS (Hurley and Hammond, 2001; Jongeling et al., 2009; Aoki et al., 2014). Cytokines have also been investigated in the field of opioid addiction and MOR function. Several studies show that the Toll-like receptor 4 may play an important role in opioid addiction and in opioid-induced analgesia via regulation of MOR function (for review, see Hutchinson and Watkins, 2014). By combining DA microdialysis with nociception sensitivity measurements following intravenous heroin administration, we were able to determine the effects of inflammatory pain on both the reinforcing and the antinociceptive properties of heroin. Our data clearly show that inflammatory pain induces robust alterations in opioid-evoked DA transmission within the mesolimbic circuit, which affects the reinforcing properties of the opioid without affecting its antinociceptive properties against thermal hyperalgesia. Indeed, we found that rats in pain needed higher doses of heroin to exhibit similar levels of extracellular DA in the NAc to those observed in control rats. Because activation of MORs in both NAc core and VTA increase DA extracellular levels in NAc core (Spanagel et al., 1992; Hipólito et al., 2008), we used the selective MOR agonist DAMGO microinjected directly into the VTA to determine that inflammatory pain-induced changes in heroin-evoked DA release are mediated via MORs in this region. Moreover, the administration of a 10 × higher dose of DAMGO intra-VTA reversed the CFA-induced effects and also confirmed that the desensitization of the MORs occurs mainly at the VTA level. In a separate study, we examined the effects of the intra-NAc core administration of DAMGO and demonstrated that pain-induced loss of MOR-mediated modulation of DA transmission was mainly localized in the VTA, and not the NAc. Finally, to explore the underlying cellular mechanisms of MOR function within the VTA, we conducted electrophysiological studies in saline and CFA-treated rats. Opioids directly inhibit ∼50% of VTA neurons via an inwardly rectifying potassium conductance (Margolis et al., 2014). However, because we used a cesium-chloride-based internal solution in our recordings, we can presume that any effects we observed were mediated by presynaptic actions of DAMGO. 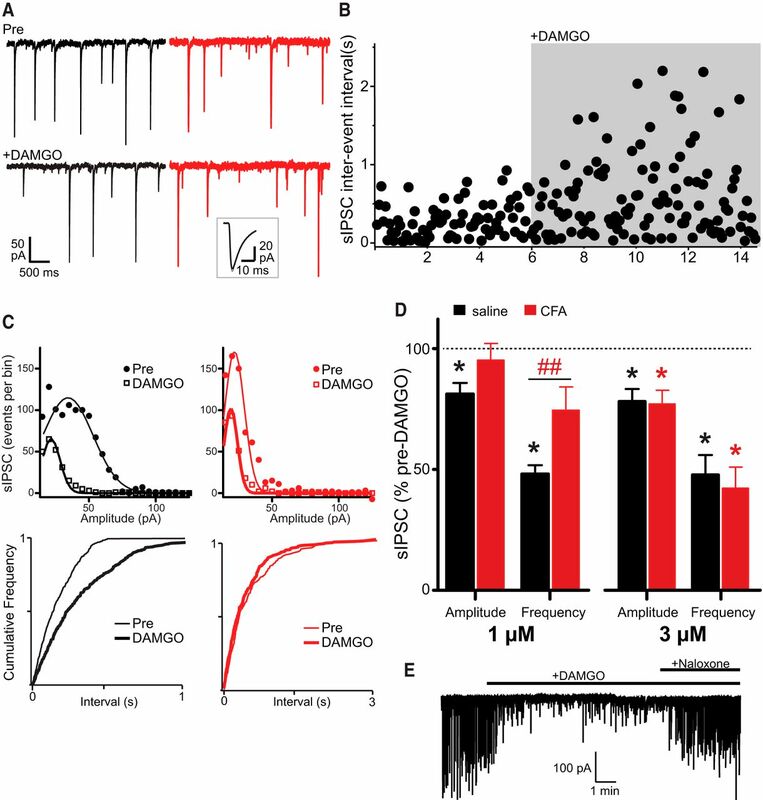 At a 1 μm concentration, DAMGO strongly inhibited presynaptic GABA release (reduced sIPSC frequency and amplitude) in neurons from saline, but not CFA-treated rats. The inability of DAMGO to reduce GABA release in neurons from CFA-treated rats was partially restored by increasing the DAMGO concentration to 3 μm (which significantly reduced sIPSC frequency and amplitude). These findings demonstrate that inflammatory pain is sufficient to induce presynaptic MOR desensitization in the lateral posterior VTA. The loss of MOR regulation of GABA release could occur in both VTA interneurons and other GABAergic projections to DA neurons. Given the tight regulation of DA neuron firing by tonic GABA release in the VTA, these results highlight an important regulatory role of MORs in the VTA during inflammatory pain. The results of these physiological experiments are directly in line with our microdialysis data. It is well established that DA innervation in ventral striatum is necessary for drug reward-related behaviors, such as drug self-administration and conditioned place preference (Koob, 1992; McBride et al., 1999). However, the role of DA transmission within the NAc in opioid seeking has been a controversial topic (for details, see Badiani et al., 2011). It has been reported that fluctuations in DA levels in NAc correlate with heroin self-administration behavior (Wise et al., 1995), MOR agonists are readily self-administered into the NAc or the VTA (Phillips and LePiane, 1980; Bozarth and Wise, 1981), and local infusion of opioids into the NAc or the VTA produces conditioned place preference (van der Kooy et al., 1982; Shippenberg et al., 1993; Walker and Ettenberg, 2005). Furthermore, blockade of D1 receptors in the NAc core impairs discrete cue-induced reinstatement (Bossert et al., 2007), and targeted expression of MORs in subsets of neurons within the ventral striatum restores opiate reward (Cui et al., 2014). These previous studies show a role for MOR within the DA mesolimbic pathway in the complex modulation of opiate seeking behavior. In our study, we demonstrated that inflammatory pain-induced dysregulation of MOR function within the VTA can lead to alterations in opiate seeking behavior. Our self-administration studies indicate that the presence of inflammatory pain alters the patterns of heroin self-administration by increasing the intake of high doses of the drug and maintaining motivation only when a high dose of the drug is presented. Although previous studies have investigated the effect of neuropathic and inflammatory pain on the reinforcing and rewarding effects of opioids in drug naive rodents using intravenous self-administration, conditioned place preference, and microdialysis (Ozaki et al., 2002; Martin et al., 2007; Wu et al., 2014), only two of these studies examined more than one opioid dose. In the study conducted by Martin et al. (2007), the maximum heroin dose tested was 100 μg/kg/infusion, which was the only dose capable of maintaining heroin self-administration following spinal nerve ligation. Consequently, these authors reported that higher doses of opioids (i.e., up to 100 μg/kg/infusion) are required to maintain opioid self-administration in neuropathic pain. However, our findings here show that the presentation of even higher doses of heroin (i.e., up to 200 μg/kg/infusion) dramatically increase opioid intake in the presence of inflammatory pain, an effect previously overlooked due to the limited dose range tested. In one sense, our data could seem counterintuitive because one would expect that heroin would have become more reinforcing because of pain alleviation (Wood, 2008). However, our microdialysis and electrophysiology data provide a mechanistic explanation, namely, a decrease in MOR function in the VTA that could explain the observed alterations in heroin intake. One plausible explanation of the pain-mediated desensitization that we observed is that the change in the endogenous opioid levels induced by pain (Zubieta et al., 2001) may finally result in different pharmacology of the opioid receptors. The increased levels of endogenous opioids may continuously activate MOR in the mesolimbic pathway that may induce depletion of DA and desensitization of MOR due to continuous activation of the receptor (Gainetdinov et al., 2004). The PR self-administration results further support the notion that inflammatory pain desensitizes MORs in the reward pathway by reducing the motivation to work for both drug and natural reinforcers. Furthermore, the observed differential effects of pain on FR versus PR schedules of reinforcement reveal a disruption in the animal's ability to determine the effort required to obtain rewards or to become motivated in performing the necessary actions to obtain rewards. Together, these behavioral results suggest that pain may act to trigger anhedonic-like behavior (Der-Avakian and Markou, 2012) or loss of effort-related motivation and decision-making (Randall et al., 2014; Pardo et al., 2015). Furthermore, these data are consistent with studies in humans that show a potential link between chronic pain and affective disorders (Jarcho et al., 2012). More interesting is that a fourfold increase in heroin dose reversed this pain-induced reduced motivation, providing supporting evidence that a change in the sensitivity to opioids could ultimately lead opioid-abusing individuals in pain to seek and consume very high doses of opioids. This work was supported by National Institute on Drug Abuse Grant DA027460 to J.A.M., Grant DA034464 to A.W.-P., Grant DA035144 to M.R.B., and Grant AA020394 to B.M.W., the National Center for Research Resources, and the National Center for Advancing Translational Sciences, National Institutes of Health Grant UL1 RR024156. We thank Dr. Richard Foltin for kindly providing drug for the studies and guidance in the self-administration experiments; Dr. Luis Granero and Ana Polache for providing microdialysis equipment and guidance; and Blake Butler and Katherine Lopez for valuable help performing the experiments. (2014) Potential involvement of mu-opioid receptor dysregulation on the reduced antinociception of morphine in the inflammatory pain state in mice. J Pharmacol Sci 124:258–266, doi:10.1254/jphs.13242FP, pmid:24553404. (2011) Opiate versus psychostimulant addiction: the differences do matter. Nat Rev Neurosci 12:685–700, doi:10.1038/nrn3104, pmid:21971065. (2014) Contribution of adenylyl cyclase modulation of pre- and postsynaptic GABA neurotransmission to morphine antinociception and tolerance. Neuropsychopharmacology 39:2142–2152, doi:10.1038/npp.2014.62, pmid:24622471. (2010) Risk factors for drug dependence among out-patients on opioid therapy in a large US health-care system. Addiction 105:1776–1782, doi:10.1111/j.1360-0443.2010.03052.x, pmid:20712819. (2007) Differential effects of blockade of dopamine D1-family receptors in nucleus accumbens core or shell on reinstatement of heroin seeking induced by contextual and discrete cues. J Neurosci 27:12655–12663, doi:10.1523/JNEUROSCI.3926-07.2007, pmid:18003845. (1981) Intracranial self-administration of morphine into the ventral tegmental area in rats. Life Sci 28:551–555, doi:10.1016/0024-3205(81)90148-X, pmid:7207031. (2007) Environmental modulation of cocaine self-administration in the rat. Psychopharmacology (Berl) 192:397–406, doi:10.1007/s00213-007-0717-z, pmid:17297633. (2013) Management of chronic pain with chronic opioid therapy in patients with substance use disorders. Addict Sci Clin Pract 8:21, doi:10.1186/1940-0640-8-21, pmid:24341916. (2008) Cellular neuroadaptations to chronic opioids: tolerance, withdrawal and addiction. Br J Pharmacol 154:384–396, doi:10.1038/bjp.2008.100, pmid:18414400. (2010) Abuse liability of intravenous buprenorphine/naloxone and buprenorphine alone in buprenorphine-maintained intravenous heroin abusers. Addiction 105:709–718, doi:10.1111/j.1360-0443.2009.02843.x, pmid:20403021. (2014) Targeted expression of mu-opioid receptors in a subset of striatal direct-pathway neurons restores opiate reward. Nat Neurosci 17:254–261, doi:10.1038/nn.3622, pmid:24413699. (2012) The neurobiology of anhedonia and other reward-related deficits. Trends Neurosci 35:68–77, doi:10.1016/j.tins.2011.11.005, pmid:22177980. (1993) Differential involvement of ventral tegmental mu, delta and kappa opioid receptors in modulation of basal mesolimbic dopamine release: in vivo microdialysis studies. J Pharmacol Exp Ther 266:1236–1246, pmid:7690399. (2002) Nucleus accumbens shell and core dopamine: differential role in behavior and addiction. Behav Brain Res 137:75–114, doi:10.1016/S0166-4328(02)00286-3, pmid:12445717. (2012) Development of mechanical hypersensitivity in rats during heroin and ethanol dependence: alleviation by CRF(1) receptor antagonism. Neuropharmacology 62:1142–1151, doi:10.1016/j.neuropharm.2011.11.006, pmid:22119954. (2005) Neural systems of reinforcement for drug addiction: from actions to habits to compulsion. Nat Neurosci 8:1481–1489, doi:10.1038/nn1579, pmid:16251991. (2015) Understanding opioid reward. Trends Neurosci 38:217–225, doi:10.1016/j.tins.2015.01.002, pmid:25637939. (2004) Desensitization of -coupled receptors and neuronal functions. Annu Rev Neurosci 27:107–144, doi:10.1146/annurev.neuro.27.070203.144206, pmid:15217328. (2013) Attenuation of cocaine and heroin seeking by mu-opioid receptor antagonism. Psychopharmacology (Berl) 227:137–147, doi:10.1007/s00213-012-2949-9, pmid:23299095. (1983) Morphine-induced activation of A10 dopamine neurons in the rat. Brain Res 277:119–127, doi:10.1016/0006-8993(83)90913-7, pmid:6315137. (1995) The effects of intravenous heroin administration on extracellular nucleus accumbens dopamine concentrations as determined by in vivo microdialysis. J Pharmacol Exp Ther 273:591–598, pmid:7752060. (2008) Shell/core differences in mu- and delta-opioid receptor modulation of dopamine efflux in nucleus accumbens. Neuropharmacology 55:183–189, doi:10.1016/j.neuropharm.2008.05.012, pmid:18582908. (2009) Local salsolinol modulates dopamine extracellular levels from rat nucleus accumbens: shell/core differences. Neurochem Int 55:187–192, doi:10.1016/j.neuint.2009.02.014, pmid:19524107. (2011) Induction of conditioned place preference and dopamine release by salsolinol in posterior VTA of rats: involvement of mu-opioid receptors. Neurochem Int 59:559–562, doi:10.1016/j.neuint.2011.04.014, pmid:21693150. (2015) In vivo activation of the SK channel in the spinal cord reduces the NMDA receptor antagonist dose needed to produce antinociception in an inflammatory pain model. Pain 156:849–858, doi:10.1097/j.pain.0000000000000124, pmid:25734988. (2005) Interactions among mu- and δ-opioid receptors, especially putative δ1- and δ2-opioid receptors, promote dopamine release in the nucleus accumbens. Neuroscience 135:213–225, doi:10.1016/j.neuroscience.2005.03.065, pmid:16111831. (2001) Contribution of endogenous enkephalins to the enhanced analgesic effects of supraspinal mu opioid receptor agonists after inflammatory injury. J Neurosci 21:2536–2545, pmid:11264327. (2014) Why is neuroimmunopharmacology crucial for the future of addiction research? Neuropharmacology 76:218–227, doi:10.1016/j.neuropharm.2013.05.039, pmid:23764149. (2011) Neuronal circuits underlying acute morphine action on dopamine neurons. Proc Natl Acad Sci U S A 108:16446–16450, doi:10.1073/pnas.1105418108, pmid:21930931. (2012) Pain, affective symptoms, and cognitive deficits in patients with cerebral dopamine dysfunction. Pain 153:744–754, doi:10.1016/j.pain.2012.01.002, pmid:22386471. (1992) Opioids excite dopamine neurons by hyperpolarization of local interneurons. J Neurosci 12:483–488, pmid:1346804. (2009) Persistent inflammatory pain decreases the antinociceptive effects of the mu opioid receptor agonist DAMGO in the locus coeruleus of male rats. Neuropharmacology 56:1017–1026, doi:10.1016/j.neuropharm.2009.02.005, pmid:19265713. (1992) Drugs of abuse: anatomy, pharmacology and function of reward pathways. Trends Pharmacol Sci 13:177–184, doi:10.1016/0165-6147(92)90060-J, pmid:1604710. (1987) Mu opioid receptor involvement in enkephalin activation of dopamine neurons in the ventral tegmental area. J Pharmacol Exp Ther 241:328–337, pmid:3033208. (2014) Direct bidirectional mu-opioid control of midbrain dopamine neurons. J Neurosci 34:14707–14716, doi:10.1523/JNEUROSCI.2144-14.2014, pmid:25355223. (1996) Within-session determination of dose-response curves for heroin self-administration in rats: comparison with between-session determination and effects of naltrexone. Drug Alcohol Depend 41:93–100, doi:10.1016/0376-8716(96)01245-8, pmid:8809497. (2007) Opioid self-administration in the nerve-injured rat: relevance of antiallodynic effects to drug consumption and effects of intrathecal analgesics. Anesthesiology 106:312–322, doi:10.1097/00000542-200702000-00020, pmid:17264726. (2014) Separate GABA afferents to dopamine neurons mediate acute action of opioids, development of tolerance, and expression of withdrawal. Neuron 82:1346–1356, doi:10.1016/j.neuron.2014.04.030, pmid:24857021. (1999) Localization of brain reinforcement mechanisms: intracranial self-administration and intracranial place-conditioning studies. Behav Brain Res 101:129–152, doi:10.1016/S0166-4328(99)00022-4, pmid:10372570. (2005) Direct evidence for the involvement of the mesolimbic kappa-opioid system in the morphine-induced rewarding effect under an inflammatory pain-like state. Neuropsychopharmacology 30:111–118, doi:10.1038/sj.npp.1300527, pmid:15257306. (2012) Pain relief produces negative reinforcement through activation of mesolimbic reward-valuation circuitry. Proc Natl Acad Sci U S A 109:20709–20713, doi:10.1073/pnas.1214605109, pmid:23184995. (2011) Opioids as facilitators of feeding: can any food be rewarding? Physiol Behav 104:105–110, doi:10.1016/j.physbeh.2011.04.033, pmid:21536057. (2002) Suppression of the morphine-induced rewarding effect in the rat with neuropathic pain: implication of the reduction in mu-opioid receptor functions in the ventral tegmental area. J Neurochem 82:1192–1198, doi:10.1046/j.1471-4159.2002.01071.x, pmid:12358766. (2003) Suppression of the morphine-induced rewarding effect and G-protein activation in the lower midbrain following nerve injury in the mouse: involvement of G-protein-coupled receptor kinase 2. Neuroscience 116:89–97, doi:10.1016/S0306-4522(02)00699-1, pmid:12535942. (2015) Selection of sucrose concentration depends on the effort required to obtain it: studies using tetrabenazine, D1, D2, and D3 receptor antagonists. Psychopharmacology (Berl) 232:2377–2391, doi:10.1007/s00213-015-3872-7, pmid:25647696. (2012) Increased anxiety-like behaviors in rats experiencing chronic inflammatory pain. Behav Brain Res 229:160–167, doi:10.1016/j.bbr.2012.01.001, pmid:22245257. (2007) The rat brain in stereotaxic coordinates (Elsevier, Amsterdam). (1980) Reinforcing effects of morphine microinjection into the ventral tegmental area. Pharmacol Biochem Behav 12:965–968, doi:10.1016/0091-3057(80)90460-8, pmid:7403209. (2008) Physical pain and associated clinical characteristics in treatment-seeking patients in four substance use disorder treatment modalities. Am J Addict 17:121–125, doi:10.1080/10550490701862902, pmid:18393055. (2014) Bupropion increases selection of high effort activity in rats tested on a progressive ratio/chow feeding choice procedure: implications for treatment of effort-related motivational symptoms. Int J Neuropsychopharmacol 18:2, doi:10.1093/ijnp/pyu017, pmid:25575584. (1993) Heroin self-administration in rats under a progressive ratio schedule of reinforcement. Psychopharmacology (Berl) 111:215–218, doi:10.1007/BF02245526, pmid:7870955. (2003) Prevalence and characteristics of chronic pain among chemically dependent patients in methadone maintenance and residential treatment facilities. JAMA 289:2370–2378, doi:10.1001/jama.289.18.2370, pmid:12746360. (2013) Rapid dopamine dynamics in the accumbens core and shell: learning and action. Front Biosci 5:273–288, doi:10.2741/E615, pmid:23276989. (2014) The antero-posterior heterogeneity of the ventral tegmental area. Neuroscience 282C:198–216, doi:10.1016/j.neuroscience.2014.09.025, pmid:25241061. (2004) Characterization of mu opioid receptor binding and G protein coupling in rat hypothalamus, spinal cord, and primary afferent neurons during inflammatory pain. J Pharmacol Exp Ther 308:712–718, doi:10.1124/jpet.103.057257, pmid:14593084. (1993) Examination of the neurochemical substrates mediating the motivational effects of opioids: role of the mesolimbic dopamine system and D-1 vs. D-2 dopamine receptors. J Pharmacol Exp Ther 265:53–59, pmid:8386244. (2015) Spatiotemporal control of opioid signaling and behavior. Neuron 86:923–935, doi:10.1016/j.neuron.2015.03.066, pmid:25937173. (1992) Opposing tonically active endogenous opioid systems modulate the mesolimbic dopaminergic pathway. Proc Natl Acad Sci U S A 89:2046–2050, doi:10.1073/pnas.89.6.2046, pmid:1347943. (2014) Results from the 2013 National Survey on Drug Use and Health: Summary of National Findings, NSDUH Series H-48, HHS Publication No. (SMA) 14-4863 (Substance Abuse and Mental Health Services Administration, Rockville, MD). (2011) GABAergic transmission modulates ethanol excitation of ventral tegmental area dopamine neurons. Neuroscience 172:94–103, doi:10.1016/j.neuroscience.2010.10.046, pmid:20974231. (2008) Predicting opioid misuse by chronic pain patients: a systematic review and literature synthesis. Clin J Pain 24:497–508, doi:10.1097/AJP.0b013e31816b1070, pmid:18574359. (1982) Reinforcing effects of brain microinjections of morphine revealed by conditioned place preference. Brain Res 243:107–117, doi:10.1016/0006-8993(82)91124-6, pmid:7116146. (2002) Highly sensitive chromatographic assay for dopamine determination during in vivo cerebral microdialysis in the rat. J Chromatogr B Analyt Technol Biomed Life Sci 772:267–272, doi:10.1016/S1570-0232(02)00106-X, pmid:12007771. (2005) Intra-ventral tegmental area heroin-induced place preferences in rats are potentiated by peripherally administered alprazolam. Pharmacol Biochem Behav 82:470–477, doi:10.1016/j.pbb.2005.10.002, pmid:16297973. (2009) Distinct opioid circuits determine the palatability and the desirability of rewarding events. Proc Natl Acad Sci U S A 106:12512–12517, doi:10.1073/pnas.0905874106, pmid:19597155. (1995) Elevations of nucleus accumbens dopamine and DOPAC levels during intravenous heroin self-administration. Synapse 21:140–148, doi:10.1002/syn.890210207, pmid:8584975. (2008) Role of central dopamine in pain and analgesia. Expert Rev Neurother 8:781–797, doi:10.1586/14737175.8.5.781, pmid:18457535. (2014) Upregulation of tumor necrosis factor-alpha in nucleus accumbens attenuates morphine-induced rewarding in a neuropathic pain model. Biochem Biophys Res Commun 449:502–507, doi:10.1016/j.bbrc.2014.05.025, pmid:24845379. (2008) Ethanol dually modulates GABAergic synaptic transmission onto dopaminergic neurons in ventral tegmental area: role of mu-opioid receptors. Neuroscience 153:240–248, doi:10.1016/j.neuroscience.2008.01.040, pmid:18343590. (2004a) Proinflammatory chemokines, such as C-C chemokine ligand 3, desensitize mu-opioid receptors on dorsal root ganglia neurons. J Immunol 173:594–599, doi:10.4049/jimmunol.173.1.594, pmid:15210821. (2004b) Liquid chromatography with amperometric detection at a nano crystalline ce-doped lead dioxide film modified electrode for determination of (R)-salsolinol (R)-N- methylsalsolinol and monoamine neurotransmitters in parkinsonian patients' cerebrospinal fluid. Analyst 129:229–234, doi:10.1039/b314277a, pmid:14978525. (2001) Regional mu opioid receptor regulation of sensory and affective dimensions of pain. Science 293:311–315, doi:10.1126/science.1060952, pmid:11452128.